The intelligent looking Rhodesian Ridgeback gets its name from the symmetrical ridge of hair on its spine growing against the grain of its coat. Loyal and intelligent lion hunters. The Rhodesian Ridgeback originated in Zimbabwe. The Rhodesian Ridgeback may be light to dark wheaten, sometimes with small white markings on the chest and feet. The Rhodesian Ridgeback's coat is short and sleek and requires very little grooming. Originally bred for fighting lions, the courageous Rhodesian Ridgeback can withstand a harsh desert climate and is unaffected by insect bites. 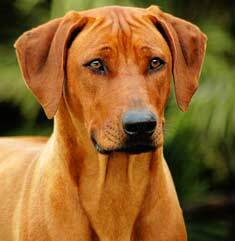 The Rhodesian Ridgeback is extremely loyal and obedient and makes a good guard dog. The Rhodesian Ridgeback is susceptible to hip dysplasia, dermoid sinus, and cysts. 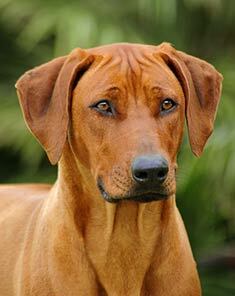 Rhodesian Ridgebacks can be expected to live about 10-12 years. 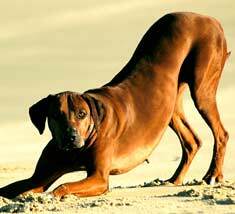 Rhodesian Ridgebacks will do well in an apartment but require a large yard for exercise. They are extremely energetic dogs and don't tire easily. This dog breed can adapt to an exercise regimen, and is best suited for country living. The first thing you are likely to notice about a Rhodesian Ridgeback is the strip of fur which creates a ridge along its spine by growing in the opposite direction from the rest of the animal’s coat. This ridge of fur is somewhat emblematic of the Rhodesian Ridgeback breed, because these dogs possess a combination of traits which sometime seem confusingly contradictory. A Rhodesian Ridgeback can be happy lazing in the sun for hours, yet instantly on guard when its family or territory is approached by strangers. The Rhodesian Ridgeback has its origins on the farms of the African veldt, where the breed was developed to protect farm livestock from big game predators. A medium to large breed, with the largest males standing 27” and weighing about eighty pounds, the Rhodesian Ridgebacks of today are descended from European dogs, including Great Danes and bloodhounds, brought to what is now Zimbabwe and the indigenous Hottentot hunting dog, responsible for the animals’ ridged backs. 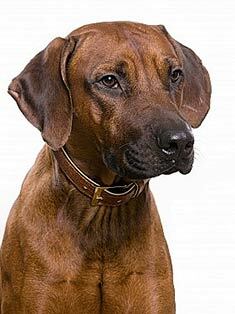 Rhodesians Ridgebacks have been bred to withstand the rigors of long distance trekking over the African plains, so are comfortable in hot climates and can be active longer than most dogs without requiring either water or food. While they are sometimes referred to as African Lion Dogs, Rhodesian Ridgebacks were used to track lions, but never actually attacked them. They did their jobs exceptionally well, being fearless in the chase, and expert at holding the lions until their masters could shoot them. The same traits that enabled Rhodesian Ridgebacks to stand up to African lions--courage, tenacity, intelligence, and great physical stamina--are traits that make them excellent guard dogs. But those same valuable guarding instincts can make a Ridgeback very possessive of its family. Ridgebacks are also among the most independent-spirited of dogs, and they need owners who train them with both kindness and authority. Basic obedience training, in fact, is essential with Ridgebacks because they are both big and smart, and you need to establish early that you are bigger and smarter. But you can’t expect your Ridgeback to win accolades at advanced obedience classes, simply because his or her hound mind is wired for self-reliance. Just make sure your puppy gets plenty of positive reinforcement for its good behavior, or you may run into some behavioral difficulties when it is older. 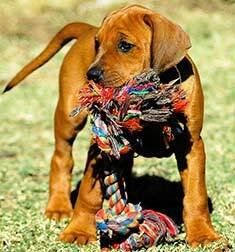 On the whole, however, the Rhodesian Ridgeback breed is an adaptable one, and will take well to a variety of environments. Caring for a Ridgeback will require you to devote plenty of time to exercise, because you’ll be dealing with a dog bred for hunting over large distances, and will have to work hard to get your Ridgeback tired. Find ways to do it which let the animal feel as if he or she is on the chase, and use the leash at all times so that the hunting instinct does not lead to undesirable consequences. Jogging or cycling with your Ridgeback on a leash are two suggestions. 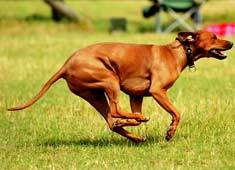 You can also consider Lure Coursing as a sport for your Ridgeback. One of the most amazing characteristics of the Ridgeback breed is that the dogs are both scenthounds and sighthounds. Lure coursing is a canine performance challenge which allows sighthounds to chase plastic bags over a course laid out to imitate the path a fleeing rabbit might follow. The American Kennel Club has its own rules for lure coursing. The lures used in lure coursing competition will travel at speeds of up to 35 or 40 miles per hour, over a looped course spread out on a field of between eight and ten acres. So as you can see, lure coursing is an activity which will let your Ridgeback feel as if he or she were back on the African veldt, and free to let loose all that boundless Ridgeback energy! If you are looking for a dog breed in which fearlessness, physical beauty, strength, agility, intelligence, and loyalty are all present, and you have the time and energy it takes to train and exercise such an animal in appropriately stimulating ways, then the Rhodesian Ridgeback could be the dog for you! Find Rhodesian Ridgeback Puppies with our Free Breeder search!